family Beach photography is a specialty of all of our Full-Time Wave photographers. If you’re vacationing along the Gulf Coast, let us document your stay with a beach photoshoot. If you’re on a dream vacation, schedule a family beach portrait session and make memories that will last well beyond the summer. HarborWalk Village is a great place to spend an afternoon. Winding along the shores of Destin harbor, the walk is lined with restaurants, shops and bars - fun for all ages! It’s also a great place to catch a dolphin cruise or fishing charter. The Emerald Grande resort anchors the walk and is the perfect place to stay if you want to be right in the action. This is a great shopping area with a mix of stores that appeal to all ages. There’s a movie theater, Whole Foods, Bass Pro Shops and Chipotle, in addition to many clothing and accessory shops. It’s right across the street from the beach so you can make a day of it and still catch the sunset over the Gulf. right Smack in the middle of Destin is Henderson Beach State Park, a huge piece of land right on the water that is protected from development. You can camp there, rent a pavilion for the day, use the playground, or just enjoy beaches that aren’t as busy as those behind more developed areas. This is a great place for your family portrait session because the long beach is unspoiled and beautiful. On the east end of Destin is Miramar Beach, home of the expansive and diverse San Destin resort. This community is a perfect place to stay, play, and of course take family photos! The Gulf side has condos and restaurants, all overlooking the Gulf of Mexico. The bayside is home to the Grand San Destin, a beautiful hotel with suites, graceful porches with tall white columns, and beautiful green spaces - the perfect spot to start a photo session before heading to the beach at sunset! From the resort, you can take a short walk down a beautiful pathway to Baytowne Wharf, a small “town” inside the resort that is always bustling with events and things to do! Watercolor is one of the largest villages along 30A, and it has a ton of variety both for photo sessions and vacationing! Their park system is large and beautifully landscaped, making it one of the prettiest picture spots along 30A. Being a watercolor beach photographer lets us live the dream of starting a photo session in the picturesque Cerulean Park, then making our way through the village just in time to capture an unforgettable portrait on the beach at sunset. Rosemary Beach is on the east end of Highway 30A. The community is anchored by The Pearl, an incredible luxury hotel that draws guests from around the world. Every street is picture perfect, so we can literally start your photo session right outside your door. As the premier seaside beach photographer, we get a lot of opportunities to enjoy Seaside’s funky blend of unique, coastal architecture and artist-driven spaces. It’s another spot that allows for a family photography session to showcase both the village and beach, giving more variety than a simple session! Ruskin Park is one of our favorite spots - we love the green park and the incredible homes lining the walkways. Watersound is a coastal community with an incredible beach access. It abuts Deer Lake State Park, which means that the Watersound beaches feel incredibly private and natural. The long boardwalk to the beach is a peaceful stroll any time of day, and also a great way to start family photos - especially if you want to include older family members who might have trouble on the sand. Alys Beach looks like a sliver of Greece right here on Florida’s Gulf Coast - everything is whitewashed and is the ultimate luxury experience. Nature paths connect the areas, lined with native trees and gorgeous art installations. Lake Marilyn is my favorite spot - with weeping willows and a gorgeous bridge arching over the water, it looks like a fairy tale. as the top Destin beach photography company, WE KNOW THE BEST SECLUDED BEACHES (TO KEEP THOSE PESKY CONDOS AND BEACHGOERS OUT OF YOUR PHOTOS!). WE DO GREAT PHOTOSHOP WORK, SO NO WORRIES IF A FEW SNEAK IN! IF YOU ARE A VACATIONING CLIENT, WE PROBABLY WANT TO SCHEDULE YOUR photography SESSION EARLY IN YOUR VACATION (BOO… RAIN). IF IT RAINS, WE TRY ANOTHER DAY. IF WE CAN’T MAKE THAT WORK, THEN YOUR SESSION FEE WILL BE REFUNDED IN FULL. 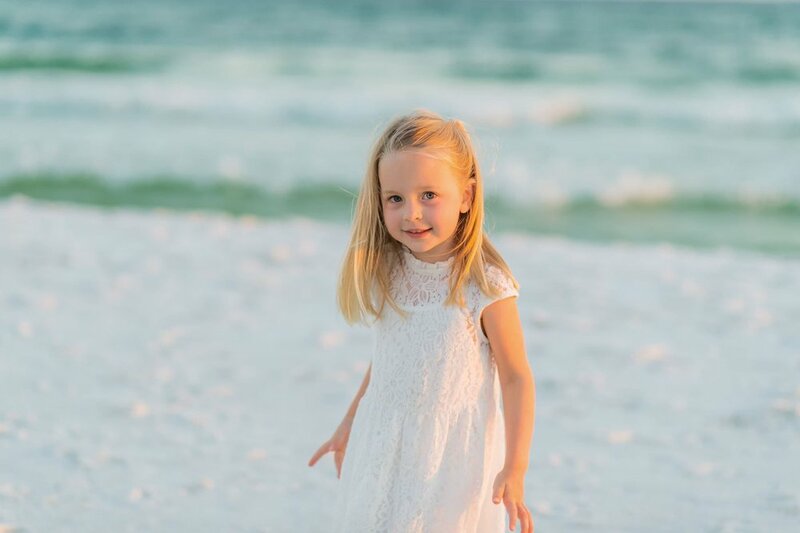 want to see more from the best Destin beach photographer? CLICK ON ONE OF our RECENT Wave photo BlogS BELOW!